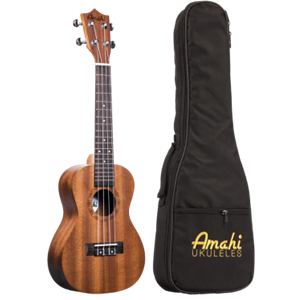 The Amahi UK210C concert ukulele is a basic student model instrument. There are bolts in the bridge hidden under an inlay to help prevent the bridge from coming loose, which is the most common issue with inexpensive ukuleles. It also has real frets that are level, which is not usually the case with ukuleles in this price range. Slightly larger in body size and scale length than a soprano ukulele, a concert ukulele offers a somewhat fuller sound. The difference between this model and the UK220C is that this model (the UK210C) has no binding and has a non-compensating saddle.